← New Product, New Wax. Working the bees in the past few months, we always wonder what we will get in return. 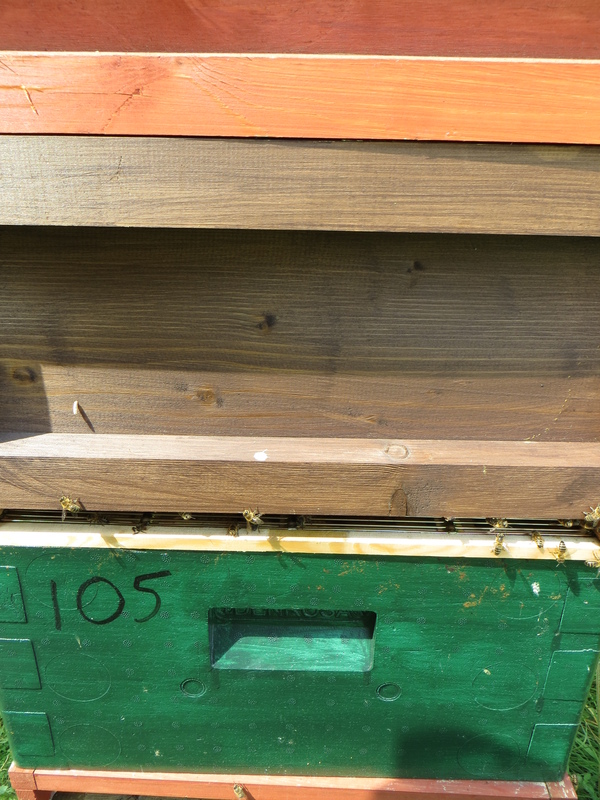 If the weather was to change it could be the end to our season, but Saturday saw us extracting more honey. After robbing the bees from one apiary of their supers we headed back to the bee unit to extract what we had. 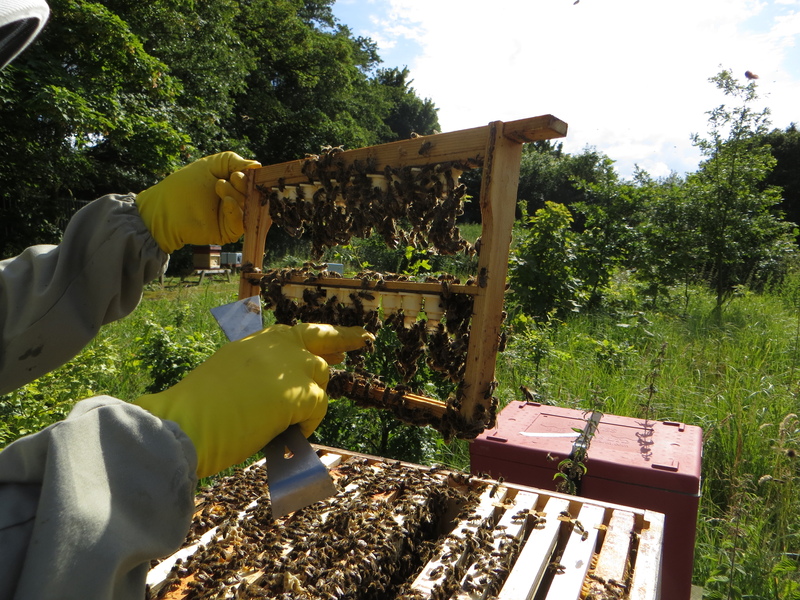 We guessed that from twelve supers they would hold about 250lb or so of honey, but after extraction we were pleasantly surprised to see over 360lb on the scales. 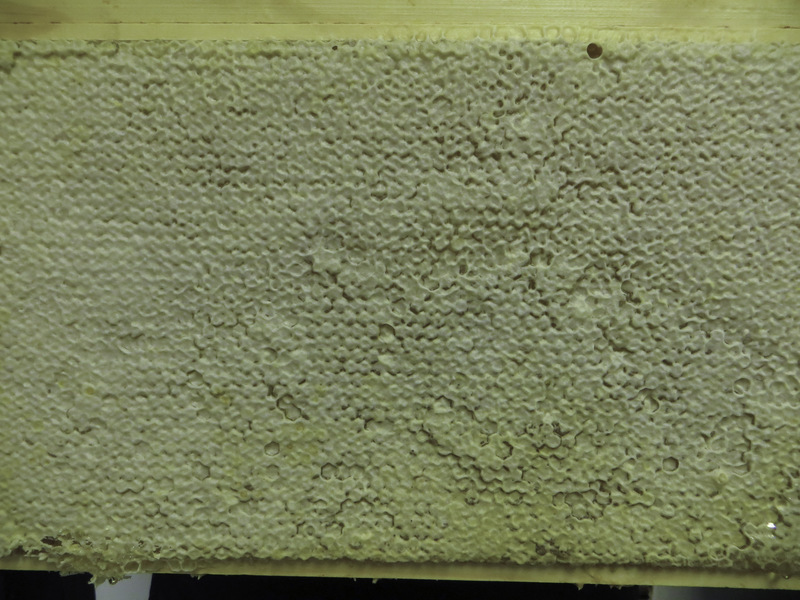 A couple of the colonies had some brood frames that were completely capped over and reducing the laying space of the queen, so we decided to take some of these out, extract them and then put them back. Today see’s us moving nucs to new apiary sites. The idea is that we get to thin a few of the sites that were getting over crowded with nucs. These nucs are doing so well that some are almost ready to go into full size brood boxes. Once these are empty, they will be re-filled with the queens from our last graft of the season. 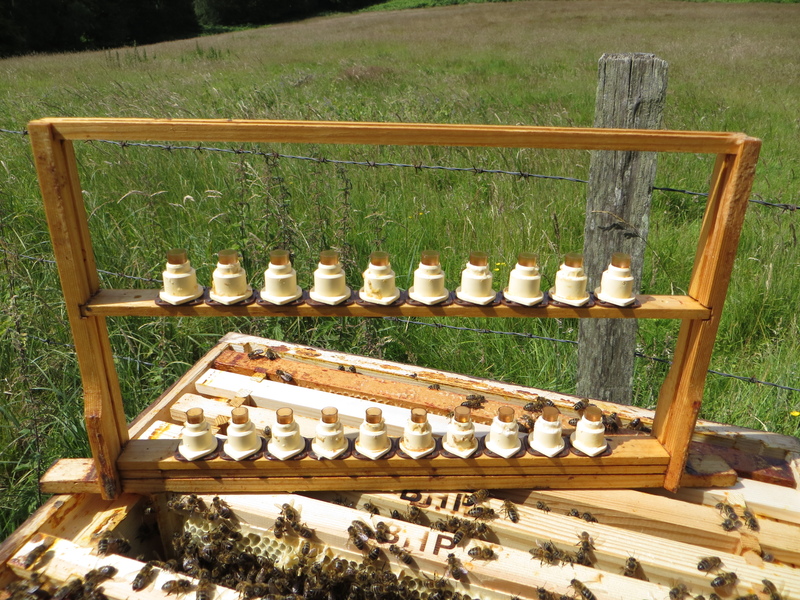 Monday, and I am doing the rounds of the apiaries and also putting supers back on from where I took them off yesterday. It will be a late one as there is honey to jar ready for the farmers market on Saturday and cut comb to box. I called Sally at work and asked her to drop in on her way home to help me box the cut comb as she makes a better job of it than me. 60, 227g jars of soft set done and 60, 227g jars of runny honey. That should keep the stock topped up for a while. I have my eye on a bottling machine and I can see we are going to need it sooner than we think. I have had a count up of all the queens we have reared that have either been sold or used for re-queening, and have decided that this week we will be grafting the final 40 grafts. I have some nuc boxes that are empty from the ones that we sold, and will be filling these up to over winter ready for expansion next year or for sale. 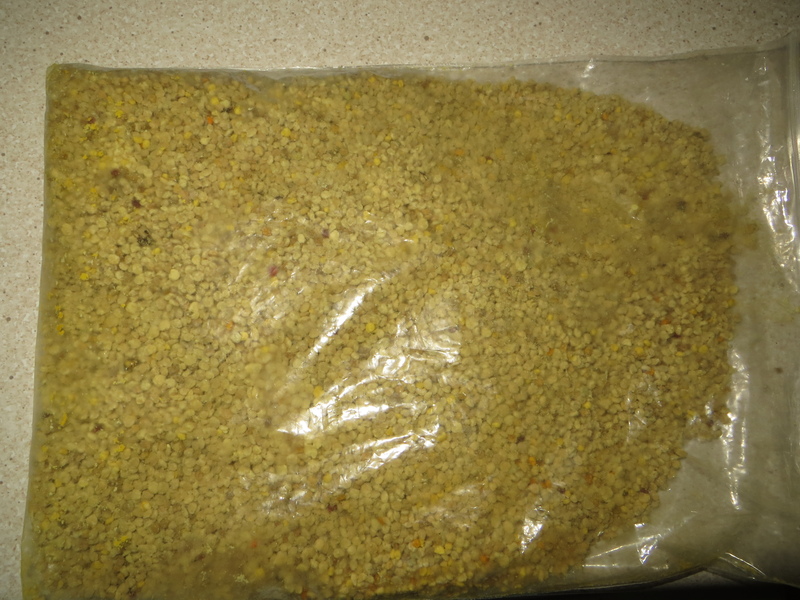 As you can see from the picture above, I have got another bag of pollen out of the freezer which I collected at the beginning of the year. This is to make the pollen frame that I will place next to the graft frame. Nurse bees don’t like to go too far to get the pollen when feeding young queen larvae. The cell building colony was re-arranged so that the bottom box containing the queen is turned 180˚ and the entrance is blocked off. The cloake board is then placed on top without the slide, and the brood box with sealed brood is on top of that. I leave this for twenty four hours, then in the morning I place the empty graft frames, which containing 20 cells each, in for cleaning. Grafting is done in the afternoon. The following day the slide is placed into the cloake board and the rear entrance is opened up. 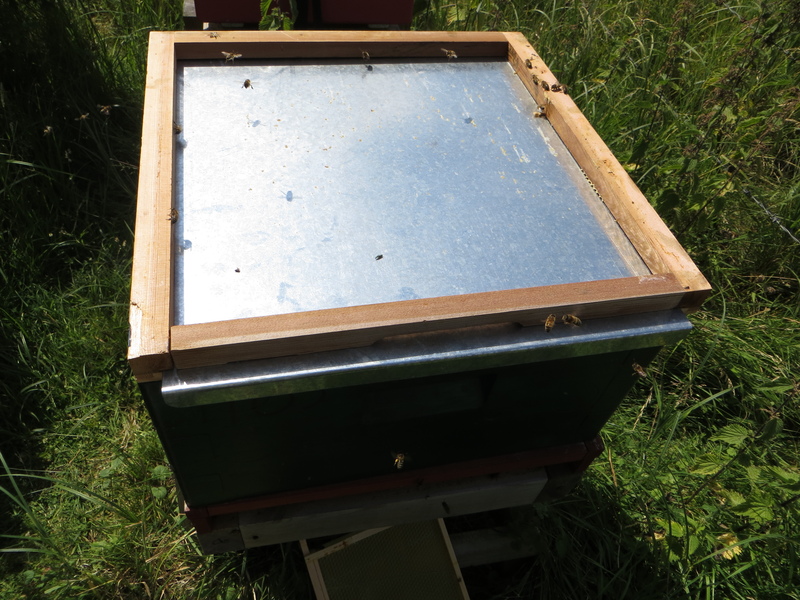 The flying bees in the bottom will enter the entrance on the cloake board and therefore re-enforce the top box. This is ideal conditions for the larvae. 24 hours later, the graft frame is checked for acceptance. This entry was posted in Beekeeping and tagged bee farmers, Beekeeping, Bees, Honey, Queen Rearing. Bookmark the permalink.